A few days ago, our wine collectors group had its scheduled team spring dinner, an annual event that celebrates the emergence of spring fruits and vegetables. Problem is, nature isn’t cooperating. We’re still waiting for some of our favorite spring produce to show up in stores in the chilly Northeast. Even though some of them are now available year-round, in our grandmother’s generation and before, people had no choice but to eat seasonally. Hence, the popular roast leg of lamb with spring peas, and a delicate salad of butter lettuce, always on Nana’s menus. 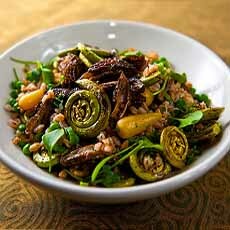 Thus, when when have a dinner to honor spring, we go full-out locavore. Here’s what you can choose from (we’ve left out the exotics; here’s the full list). Because of imports from the southern hemisphere where the seasons are reversed, Americans have year-round access to what locally has been seasonal. There’s always someplace on earth that grows asparagus, for example. COCKTAIL: Blood Orange Margarita, Mimosa or Screwdriver with fresh-squeezed blood orange juice, or this Cherry Blossom cocktail. FIRST COURSE: Spring sauté: asparagus, fiddleheads, garlic, morels and ramps, sautéed in good butter and swerved with a sprinkle of salt. It’s simple, yet memorable. MAIN COURSE: Leg of lamb, spring peas, baby potatoes. We like to cook a leg for leftovers: lamb salad† and lamb sandwiches. See our Lamb Glossary for the different cuts and types of lamb. SALAD COURSE: Belgian endive, butter lettuce (Bibb or Boston), fennel, snow peas and garlic scapes, dressed with a Dijon and sherry vinaigrette and garnished with fresh parsley. CHEESE COURSE: Spring cheeses with black mission figs. 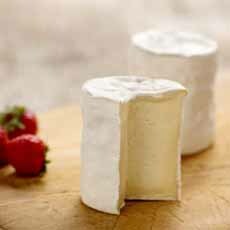 We can find bucheron and charollais affine (goat), coulommiers (cow) and Pyrénées brebis (sheep), plus cheeses from local American artisan cheese makers. Ask your cheesemonger what he/she has that’s newly arrived in spring. DESSERT: Rhubarb, any way you like it; blood oranges supreme, or in sorbet. Since strawberries, now available year-round, are a traditional spring fruit, a strawberry-rhubarb pie or galette (photo #5) does the trick. Of course, there will be more than one spring dinner. We’ll feature more of the menus as we make them, and look forward to any contributions from you. *Fava beans require a level of patience to shell, which we lack. Should you be come across shelled fava beans, it’s worth paying the premium for the labor involved. †Recipes: lamb, cucumber and watercress salad, lamb niçoise salad and Thai lamb and asparagus salad. 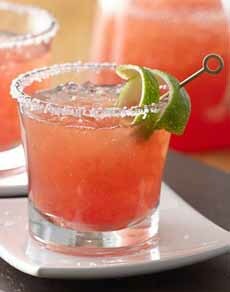 Blood Orange Margarita (here’s the recipe via Betty Crocker). A spring sautée (here’s the recipe from Honest Food. 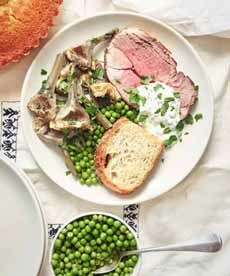 Leg of lamb with spring peas (here’s the recipe from Good Eggs). 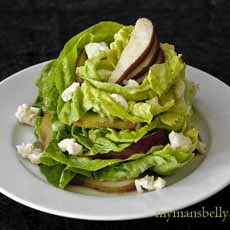 We love how the bibb lettuce is stacked in this salad (the recipe from My Man’s Belly). Lillé, a cheese from Vermont, is the American-made version of French Coulommiers. 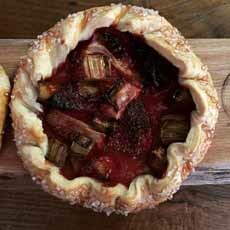 A strawberry rhubarb galette is the perfect seasonal pie (photo Hewn Bread | Chicago).